Separation Anxiety: Creating a tool to stand-in when Mom can’t be there. Aren’t I lovely in my sequin dress?… My daughter picked it out of course. Lately she has been hanging on to my leg. Literally. When my husband tried to take her to tumbling class, she screamed so much she almost missed class because she wanted Mommy to take her. I know kids go through many phases but each one seems like the worst one while it is happening. She has a security “blankie” but that doesn’t seem to be enough. I thought if she could take a piece of me with her, it would help her transition from separation anxiety to more independence. I wanted to have something we made together that reminded her Mommy was always just a hug away. So we “built-a-bear”! We went to Build-A-Bear workshop to make a “Mommy Bear” who could be my stand-in when I wasn’t there. We talked about why we were going there and what we were going to do. Words don’t mean much to a two-year old but once she hit the door- she was excited. She and I looked at all the fluffy, stuff-able choices and she picked one she wanted to be “Mommy Bear”. Next we looked at the “Say it with Sound” options. You can add different pre-recorded sounds such as “I love you”, Happy Birthday, songs from Frozen, the TMNT theme song, and many more. You can also choose a customizable recorded message in your own voice. I was on the fence as to whether my voice would make her feel comforted or just miss me more. I did decide to record a message in my own voice. In retrospect- I might have chosen a pre-recorded “I love you” or something similar instead. I’ve been told now that she gets more anxious when she hears my voice. Lesson learned. You know your kids best so use your judgment on this one. After we added the sound and were getting ready to stuff, I picked up a heart and we talked about what it meant. I told her that I was putting my heart inside “Mommy Bear” so that I could be with her anytime she needed me. We gave the heart a big hug and put it in the bear to be sewn up and protected forever. She got a big kick out of “helping” to stuff the bear with the fun foot pedal. Next, we went to pick out an outfit… and oh my, the clothes. It’s like a giant dress-up closet! Princesses, super heroes, Frozen, Star Wars, TMNT, birthday accessories, bathing suits, camo, tiaras, heels, boots, play cell phones… I felt like a big kid in a huge doll closet! 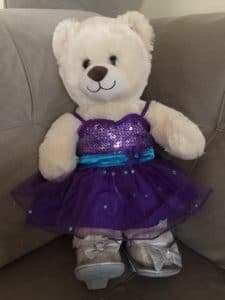 My daughter finally decided on a sequin dress and high heels (I always walk around the house in my sequence attire, right? Not a chance!). She picked what she liked. And I look fabulous in purple sequence. Well, the bear does anyway. Once we had all of the things a bear really needs, we completed our visit and went home. She held onto the bear for a while and by the next day, Mommy Bear was called to duty. On her way out the door with Daddy, she turned around and grabbed Mommy Bear to come with her. No yelling. No kicking and screaming to turn around for Mommy. No need to-since my stand in was there. All she has to do is give Mommy Bear a hug and she knows Mommy is always there. She used the bear a lot for a while and now she seems to need her less and less. She can make it through trips with Daddy and visits to Ga-Ga’s without a total meltdown. I am certainly no psychologist, but I am glad we have Mommy Bear. I have a friend who used this concept when she and her husband first separated. They took their daughter to Build-A-Bear together. They all built the bear as a family and made a special point of putting two hearts in the bear. Each parent kissed the heart and stuffed it inside- so her bear had two hearts, one from Mommy, and one from Daddy. This way, no matter where she was or who she was with, she would always have both Mommy and Daddy with her. I learned of this story after asking about the bear because it went everywhere with her. Just a small gesture that helps in such a difficult time. I wonder if this might work for trips to summer camp or back-to-school? There’s even a new line called StarBrights that have built in light up sound and glow in the dark features (great for kids who might be afraid of the dark). Hit the lights…StarBrights are here! There are so many options at Build-A-Bear. Click on an affiliate link on the page to check out all the sizes/styles/options that would fit your child’s need. Moms, help! What techniques did you use to ease separation anxiety? Information contained on livinginhappyplace.com should not be mistaken for professional advice. I am not a psychologist, doctor, financial advisor, teacher, or any other expert that would qualify me to give you professional advice. I’m just a mom, sharing my stories, hoping you might have some tips for me too!